John Steinbeck’s novella is such a staple of middle and high school reading lists that it may be easy (in my experience, at least) for it to blend into a series of vaguely recalled Western frontier archetypes typical of The American Novel, ranches and all. Unit 102’s intimately staged production of the author’s self-penned stage adaptation is above all a reminder of the book’s sensitive rendering of its mostly male figures, and if it doesn’t wholly succeed in sticking the landing when it comes to the story’s tragic conclusion, it does a very good job of putting us in Steinbeck’s weary and hopeful world. Indeed, immediately upon stepping inside to the theatre lobby you are met with the tinny, brash sound of period-appropriate jazz, as well as the smell of the smokey outdoors. The performing space initially appears smaller than it actually is: the first scene’s cramped forest clearing (complete with sand and various brambles) gives way to the ironically far more open space of the ranch interior, achieved by a simple but very effective set transition that is worth experiencing unspoiled – kudos to MyTheatre Award-winning set designer Adam Belanger. There’s also a small, makeshift brook to the far right of the audience and away from the main action which gets a little use, but which mostly serves to make us feel immersed, in a slightly haphazard way, within the rural space of the story. Taken together, this sensory experience of the story is very effective, though it does mean that audience members inhale just as much herbal cigarette smoke as the cast. George (Brandon Thomas) and Lennie (Marc Paci) are two unemployed ranchers on the run from their previous job in Weed, California, following Lennie’s unwitting harassment of a local woman. Bound to one another since childhood, their relationship is both strengthened and strained by the paternal role George must take with Lennie, who has the IQ of a young child, but the strength of a bear. They both dream of buying a house and living off “the fat of the land”, but with no education, the two must continue looking for ranch work, which only George is capable of rustling up for them. The first scene, set in a forest opening where the two men take refuge, is an affectionately performed introduction to their dynamic. Both Paci and Thomas are less rough-hewn than their most famous predecessors, John Malkovich and Gary Sinise (in Sinise’s film adaptation of twenty-four years ago): Paci emphasizes the childlike and teddy bear-ish aspects of Lennie, and he gives a committed and carefully crafted performance – Lennie’s sudden transitions into violent rages are as convincing as his naive wonder. However it’s Thomas, particularly in the first half, who feels like the emotional centre of the production. He nicely articulates George’s deep frustration at having tied himself to someone he cares for so deeply but who is destined to limit his life’s potential. In a scene near the play’s midpoint where he explains their relationship to rancher colleague Slim (Jim Gilbert, tough and sensitive in equal measure), his affection and regret, almost casually deployed as if he has explained the situation many times, both to himself and other people, is conveyed beautifully. Director David Lafontaine has assembled a strong supporting cast, almost all of whom are given moments to claim to our attention. The centrepiece scene is the last one of the first half, where a night of card playing turns to violence and ultimately a strained, extremely masculine (i.e. near-silent) sympathy following the execution of a beloved but sick dog. It’s a lengthy scene that features just about all the key players, illustrating the collective frustrations and suppressed sympathies of this group of ranch workers. While everyone does an excellent job of presenting the Southern swagger and charisma we associate with these characters, it feels like a deeper level of real empathy shared between the men may have been missed. Perhaps that’s why Thomas’s tenderness stands out as much as it does in this production, and indeed that may be what is supposed to set George apart as a character. This shouldn’t take away from the lovely work done by the cast, particularly Thom Zimerle as Candy, with a quailing voice who is just as passionate as George and Lennie in his desire for ease and escape, and Brandon McKnight as Crooks, who has a fantastic scene at the top of Act Two where he gets right to the heart of his frustrations at being excluded from post-work company because he is black. McKnight presents a neutral exterior that easily and convincingly gives way to combined fury and excitement at finally having someone (Lennie) who appears willing to offer company and a friendly ear. Miranda MacDougall as the unnamed wife of Curley (a strong Daniel Staseff) and the only woman of the story gives an extremely vivid performance, nicely shading a character that both the ranch men and Steinbeck seem unsure of. The accident in the penultimate scene is excellently and tensely pulled off by her and Paci. However, it’s here that the energy and tragedy of the story dilutes somewhat, as Thomas seems rather unmoved by the catastrophe that has occurred and what it means, and the ending is rather abrupt – – I don’t know if Steinbeck wrote it so that the play ends a couple of beats earlier than the novella, but as it plays here it feels a touch unsatisfying as a way to leave us. Still, this is a confidently and at times quite moving production of a story that shouldn’t be relegated to a school syllabus memory. 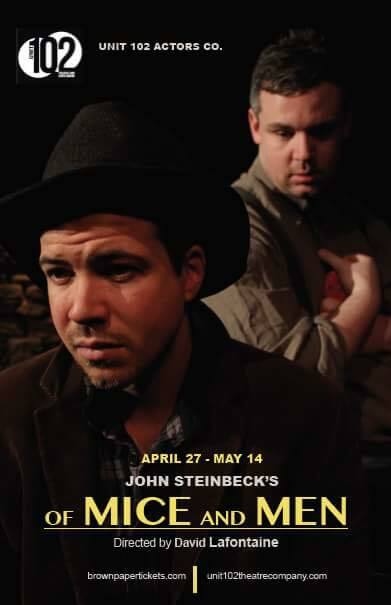 Of Mice and Men plays until May 14th at 376 Dufferin St. Get your tickets HERE. In: Adaptations, Contemporary Theatre, Indie Theatre, Reviews, Theatre Reviews, Toronto, Unit 102 Actors Co.